Antiquities dealer Nancy Wiener was arrested Wednesday morning in Manhattan and charged with conspiring with international smuggling networks to buy, smuggle, launder and sell millions of dollars worth of stolen Asian art thru leading auction houses. Wiener is a second generation dealer who runs one of the country’s most prestigious Asian art galleries on Manhattan’s Upper East Side. For nearly three decades, the Nancy Wiener Gallery has sold Asian art to private collectors and museums, including the Metropolitan Museum of Art, Asia Society, the Los Angeles County Museum, the Art Institute of Chicago, the Nelson-Atkins Museum, the National Gallery of Australia and the Asian Civilizations Museum in Singapore, according to her website. The criminal complaint filed after her arrest on Wednesday alleges Wiener was part of a sweeping conspiracy to funnel stolen artifacts into the art market. For decades, the complaint alleges, Wiener has bought stolen and looted antiquities from thieves and smugglers across Asia; sent them to restorers to erase evidence of their theft; and then laundered them through Sotheby’s and Christie’s auction houses, using straw buyers to create false ownership histories and artificially set market prices. The 12-page complaint, signed by ICE Special Agent Brenton Easter, cites “tens of thousands of pages of emails, documents and photographs” recovered during more than 50 search warrants carried out since 2007. Easter has been the lead investigator on Operation Hidden Idol (the Subhash Kapoor case), Operation Mummy’s Curse and most of the other prominent federal investigations of the illicit antiquities trade in recent years. The prosecutor on the case, Manhattan Assistant DA Matthew Bogdanos, also has a long track record disrupting antiquities smuggling networks and is the author of the book Thieves of Baghdad. Wiener’s attorney, Georges G. Lederman, told the New York Times his client had surrendered voluntarily. “We are examining the charges and will respond at the appropriate time,” Lederman said. I’ve asked Sotheby’s and Christie’s for comment on the allegations. I’ll post their responses here when I receive them. Wiener’s alleged ties to the black market first came to light in 2014 when Michaela Boland and I reported in The Australian newspaper that the dealer had provided a false ownership history when she sold a $1.08 million Seated Buddha to the National Gallery of Australia. As I detailed later, the story started in 2012 when a source tipped me off that Wiener had bought the Australian Buddha – and a matching one that she sold to the Singapore’s Asian Civilizations Museum – from an Indian antiquities trafficker. Australian authorities conducted their own investigation and reached the same conclusion. They returned the Buddha to India earlier this year, and Wiener was forced to refund the purchase price. Wednesday’s criminal complaint cites the two Seated Buddhas as evidence of Wiener’s criminal conduct and reveals important new details about their illicit origins. She sold the first to Singapore’s ACM without being asked to provide its ownership history, the complaint states. After I repeatedly asked the museum to release its records (to no avail), the museum appears to have contacted Wiener for additional information. According to the complaint, Wiener gave the ACM an evolving series of stories about its previous owner: first she said it had been in a “European collection” for decades; then she said the owner’s father had acquired the piece in India. Finally, she named the former owner and said he had purchased it while stationed in Vietnam in the 1960s. That name, Ian Donaldson, is the same false story she provided to the National Gallery of Australia. In fact, records seized during the investigation show that Wiener acquired them both from none other than Vaman Ghiya, the notorious Indian idol thief whose criminal case was profiled in the New Yorker in 2007. Photos of the ACM Buddha seized during the investigation show it “wet as it lay on a dirty floor in front of a black backdrop” – presumably as it appeared shortly after being looted from India’s ancient city of Mathura, the second capital of the Kushan empire. The sculpture remains on display in the Singapore museum. While they are not accused of criminal conduct, Sotheby’s and Christie’s play a prominent role in the alleged criminal conspiracy described in court records filed Wednesday. Several objects illustrate how the auction houses allowed Wiener to launder looted antiquities by accepting false ownership histories without question. When Wiener consigned a Cambodian sculpture of 11th century Shiva at a 2011 auction at Sotheby’s, the auction house noted that cracks in the sculpture “had been dressed up with plaint splatters to mask repairs” – a clear sign of looting, according to the complaint. Sotheby’s nevertheless accepted Wiener’s word that it had been out of Cambodia since 1968 and required no documentation from the dealer to support the claim. When selling Lot 29 at the March 24, 2011 sale, Sotheby’s described it as coming from a “Private English Collection, acquired 1960s.” “This exceptional figure exemplifies the highest achievements of the Baphuon School and is arguably amongst the best of its kind,” the catalog noted. It sold for $578,500. In fact, there was no English collection, the complaint alleges. Seized emails show Wiener and a co-conspiritor (“an antiquities dealer based in London and Bangkok”) had acquired the sculpture “direct from a supplier, and not through a dealer” for half its market price. They sent it to London to be “cleaned, put together and mounted,” all evidence, the complaint alleges, that it had been recently looted. I’ve asked Sotheby’s attorney (and former federal prosecutor) Jane Levine for a comment and will post it when I hear back. Christie’s is also singled out in the complaint for the sale of nearly 400 objects – many of them allegedly looted or stolen – that had belonged to Nancy Wiener’s mother Doris, a prominent dealer in her own right who pioneered the Asian art market in the 1960s and 70s’s with sales to prominent collectors like John D. Rockefeller and Jacqueline Kennedy. Doris continued to deal until her death in 2011, when Nancy inherited her mother’s collection and allegedly destroyed all records of the smugglers from whom they had been acquired. Wiener intially tried to consigned the collection for sale at Sotheby’s, but was turned away because she could not provide their ownership history. So Wiener turned to Christie’s, which according to the complaint only required evidence that the objects had been on the market since 2000 – a full 30 years later than the 1970 standard required by most museums and archaeologists. Even that low bar was too high for Christie’s, which allegedly only asked Wiener for documentation on the top 25 of the sale’s 380 lots. Wiener told Christie’s 10 had come from Spink and Son, a defunct London auction house that has frequently been linked to looted antiquities. Several others had previously been sold at auction by Doris and re-acquired in “straw purchases” designed to create the impression of good provenance. This dodgy track record for a fraction of the lots appeared to be enough for Christie’s, which auctioned all 380 lots on March 20, 2012 for a total of nearly $12.8 million dollars. UPDATE: On December 28, Christie’s released a brief statement on the arrest of Nancy Wiener: “We are aware of these very serious allegations against the defendant and are monitoring the legal proceedings closely. We will withhold further comment until the appropriate time.” I’ve asked whether they will notify customers who purchased objects from the Doris Wiener sale and will post a response when I receive it. Dozens of the objects sold in that sale have now been tied to smuggling networks reaching from Afghanistan and Pakistan to India, Cambodia and Thailand. We’re report details of those networks soon. 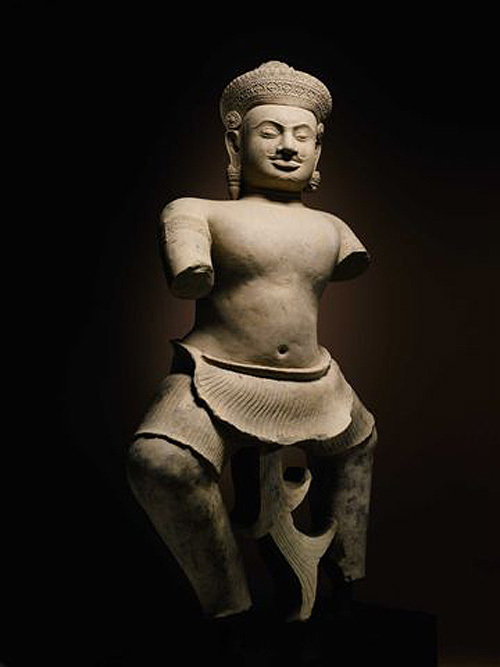 UPDATE 5/6/14: The Norton Simon Museum and Christie’s auction house have agreed to return two additional sculptures looted from the Praset Chen temple at Koh Ker, Cambodia, the New York Times reports. The Norton Simon’s Bhima has been on display since the 1970s. Christies sold a looted sculpture of Pandava twice, most recently in 2009, and bought the sculpture back from the anonymous buyer when information emerged about its looted origins. They are the fourth and fifth objects from the looted temple to be returned. Two additional sculptures from the site remain on display at the Denver Art Museum and the Cleveland Museum of Art. Cambodia is quietly negotiating the return of several important 10th century sculptures that were looted from the temple complex of Koh Ker in the 1970s. Officials from the Norton Simon Museum in Pasadena recently traveled to Phnom Penh to discuss the fate of its looted Bhima (right). “We have met and had constructive conversations that are continuing,” said Luis Li, an attorney for the museum. Several other museums are also in talks with Cambodia about objects in their collections. 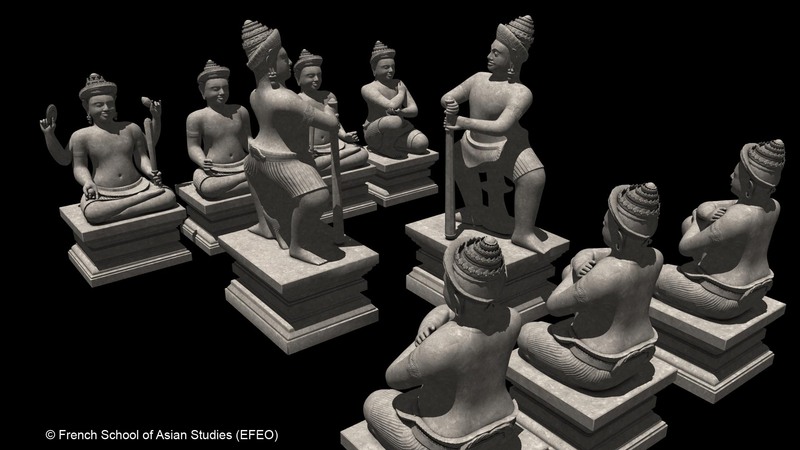 While the returns are being negotiated by Cambodian authorities, archaeologists with the French School of Asian Studies (EFEO) have been busy reconstructing the Koh Ker temples with the tools of virtual reality. By sewing together thousands of digital pictures of the sculptures into 3D images, they’ve re-created their original context in the now ruined temples. At EFEO’s website you can watch a remarkable video showing what the site might have looked like soon after its construction by Jayavarman IV. 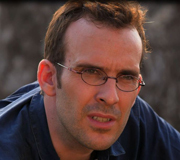 One of those behind this work – and some of the original detective work that linked them to the temple – is French archaeologist Eric Bourdonneau. 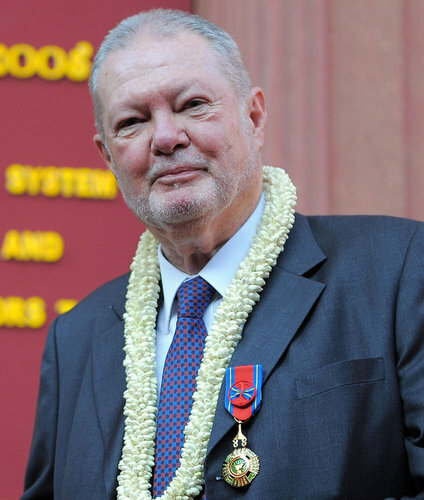 He graduated from the Sorbonne with degrees in Archaeology and Oriental Studies. His 2005 Phd was entitled “Indianization and Formation of the State in South-East Asia: A reappraisal of the Historiography of the last Thirty Years.” He has been a lecturer at the EFEO since 2007. Here’s my Q and A with Bourdonneau. Q: How did you become involved in the case involving the Duryodhana at Sotheby’s? Let’s talk first about the Bhima statue at the Norton Simon Foundation. * As far as I know, the connection between the Prasat Chen and this statue (published in Bunker and Latchford 2004) seems to have been made for the first time by a member of the GACP team (a stone conservation German project) who sent a short letter to Unesco in 2007 (I was informed about this letter quite late in 2011). Personally, I saw the pedestal of the statue during the first archaeological campaign I made in Koh Ker in 2009. I made also the connection with the Norton Simon statue that I identified then as a statue of a fighting Bhima … and so concluded that the other pedestal close at hand was for a Duryodhana. But, at that time, I didn’t know of any image of this Duryodhana. 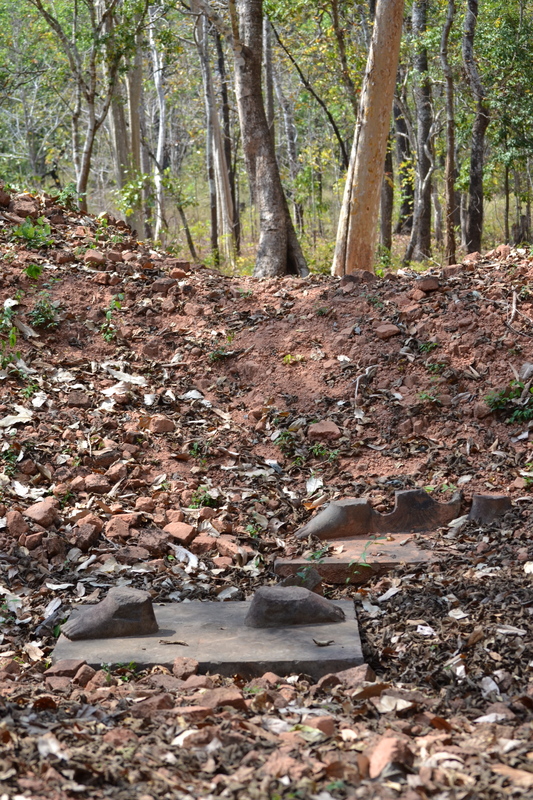 The feet of the Duryodhana and the Norton Simon’s Bhima in situ in Koh Ker. I saw it for the first time at the end of 2010 when I presented my work to my colleagues of Guimet Museum, Pierre Baptiste and Thierry Zéphir. They showed me a photo of this statue, a photo that was in the Museum Archives but with no information about its origin, its identification or its localization. The next step was just one week before the sale in New York (March 2011). I was informed almost by accident (I was probably the last one to be informed among those concerned by the sale…). Ironically it was a collector that told me that a statue of “Koh Ker style” would be on sale. I prepared straight after a report (with photos, dimensions and iconographical “demonstration”) and sent it to Unesco office in Phnom Penh (where people were wondering about the authenticity and the provenance of this statue) and this report, I was told, was immediately transmitted to Cambodian Ministry of Culture. I also made several presentations since 2009 and published a quite long article in 2011 where I explained why these statues should be identified with the two images of Bhima and Duryodhana at Prasat Chen and why there was little doubt that the two “Met pieces” (the Pandava brothers), among others, came from the same building. Q: How did you ultimately make the match between the sculpture and its feet? The abandoned feet at Koh Ker superimposed on the Temple Warrior at the Norton Simon, from a report to UNESCO by researcher Simon Warrack. It is not so difficult. The position, the style, the dimensions (e.g. dimensions of the breaks at the ankles, taken in situ) left not much doubt. It is a little more difficult to show that such a statue could come only from Prasat Chen and not from another temple. The iconographic analysis is essential for that. Q: Have you found any other matches to objects missing from Koh Ker or other Cambodian sites? Where are these objects today? There are indeed a quite significant number of similar cases. The most obvious are those for which where we have photos in the archives: for example, the Ganesha from Prasat Bak or the lion (right) from the Shiva pedestal in Prasat Thom (and today in Dallas Museum). Many of them are now in private collections so it is not easy to know their current location. At least it is possible to know when and where they were sold thanks to sale catalogues published by auction houses. Q: The Duryodhana and the Met’s Kneeling Attendants have been returned. Others may soon follow. Where will these objects be displayed in Cambodia? What significance does this have for the local people? I have no precise information about this. But, of course, they will be exhibited. You better have to ask to Cambodians themselves. Obviously they have many reasons to be proud of their heritage and to celebrate the return of these remarkable pieces. It is important to remind what we are talking about: a deliberate destruction that did not care about the integrity of the artworks, provided that there were people ready to purchase them. The state of conservation of these artworks in stone was remarkably good as they were still buried when looted. It is maybe not useless to say again, as Elizabeth Becker rightly wrote in NY Times, that the fury of the Khmer Rouge was, sadly, directed much more against people than stones: in Koh Ker, the only traces of vandalism, of which there are many, ­are those left by the modern looters whose spoils fed the art market (some of them can be seen on the knees of the two “MET statues”, cut hastily and coarsely from their pedestals with dozens of blows of a chisel). The so-called Sotheby’s or MET statues, like many of their kind extracted from their original surroundings, have remained impossible to understand as long as we have not been able to replace them in the temples where they were erected, that is, as long as we have not restored what was destroyed forty or thirty years ago by the looters. What is at stake here is not only “heritage” but history. *We’ve edited Eric’s response to make clear he was referring here to the Bhima, not the Duryodhana. Sotheby’s and a private collector agreed on Thursday to forfeit a 10th century statue of a warrior to Cambodia, ending a lengthy legal fight that exposed the trafficking of looted Khmer antiquities to museums and collectors around the world. The agreement states that Sotheby’s will transfer the statue of Duryodhana to Cambodia within 90 days in exchange for the U.S. government dropping a lawsuit brought on behalf of the Cambodian government. The suit claimed the auction house and Belgian collector Decia Ruspoli di Poggio Suasa had attempted to sell the statue in 2011 despite their knowledge that it had been looted from a Cambodian temple. There was never any doubt about whether the statue had been looted, or where it had been found. 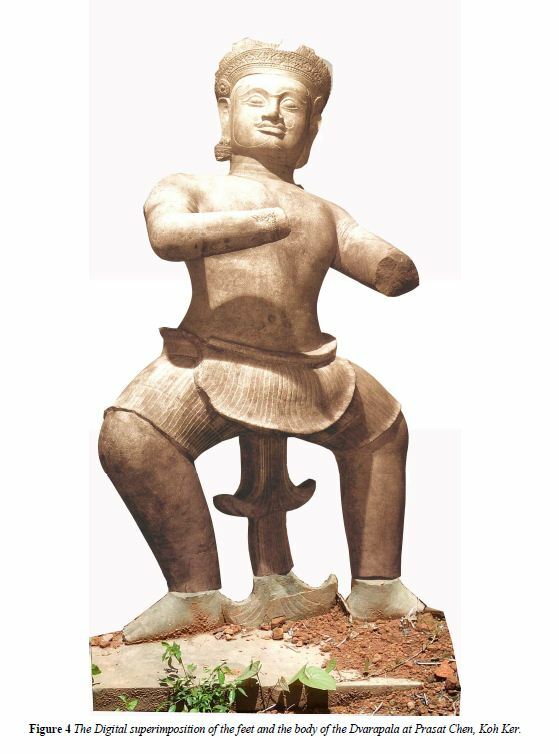 As we wrote in April 2012, internal emails cited in the case revealed that Sotheby’s officials were warned by an expert that the statue had been stolen from the Khmer temple of Prasat Chen, in Koh Ker, and that its public sale might lead to a legal claim. Sotheby’s officials decided that while it might receive bad press from “academics and ‘temple huggers,’” the potential profits from the sale made it “worth the risk,” internal emails showed. Thursday’s agreement to forfeit the statue shows that calculation was decidedly wrong. Sotheby’s could have returned the statue to the collector and let her decide its fate, as auction houses have often done when claims arise. It also could have accepted a $1 million offer from a private collector who sought to buy the statue on Cambodia’s behalf. Instead Sotheby’s opted to fight it out in court – at considerable cost to both its bank account and its reputation. One of the lingering questions from the case is, why? Some have pointed to the personalities involved in the case, which pit the US Attorney’s office in the Southern District of New York against Jane Levine, one of the former stars of its cultural property crimes unit who now works as Sotheby’s Director of Worldwide Compliance. In a series of bare-knuckled filings, the government accused Levine of providing “false and misleading information to the Government.” Levine pushed back, accusing investigators of misleading the auction house about having probable cause for the statue’s seizure. Another theory, floated this weekend at a UN-sponsored conference in Courmayeur by a prominent retired art crimes investigator, is that Sotheby’s may have taken on partial ownership of the statue. Why else would it spend what were likely hundreds of thousands of dollars in legal fees defending someone else’s problematic statue? Attention now shifts to other Khmer statues likely acquired through the same smuggling network. Over the past year we and others have traced objects from Koh Ker and other sites that passed through the hands of Douglas Latchford before ending up in museums across the United States and Europe. The case for the return of those objects has now grown much stronger. In May, the Metropolitan Museum of Art agreed to return its two Khmer Kneeling Attendants, which it acquired from Latchford and other donors. The decision was reached after museum officials traveled to Cambodia and were presented with “dispositive” evidence of the statues’ illicit origins. The Met continues to possess several other objects tied to Latchford that have not been returned. Cambodia has indicated it is preparing to makes similar claims against Khmer statues tied to Latchford at the Kimbell Museum, the Cleveland Museum and the Denver Art Museum. Many more exist in private collections. The owners of these blood antiquities would be wise to learn from Sotheby’s experience and not wait for a demand from the U.S. Attorney’s office. Here’s the stipulation Sotheby’s signed on December 12th agreeing to the statue’s return. Last week the tables were turned on the U.S. government as documents filed in court by Sotheby’s revealed the private deliberations of American investigators, whose zeal for the return of an allegedly looted 10th century Khmer statue often appears to exceed that of Cambodian officials. In December, we wrote that filings in the court battle between the U.S. government and Sotheby’s over the statue had revealed the inner workings of the top international auction house. Last November we described how the case had revealed the underbelly of the illicit antiquities trade. Now it’s the U.S. government’s turn. The exhibits, obtained through discovery in late August and attached to a Sept. 9th Sotheby’s motion for judgment, provide a rare window into the investigation of a major international cultural property case whose outcome will likely hold sway for years. The emails detail how Interpol officials worked close with Brent Easter, an investigator of cultural property crimes at Immigration and Customs Enforcement, to build a legal rationale for the statue’s seizure on behalf of Cambodia. The process eventually involved officials at the U.S. Department of State, the American Embassy in Phnom Penh and the Cambodian government. At one point, Easter asked Cambodian officials to stop negotiating with Sotheby’s for the statue’s voluntary return so that the U.S. government could purse its legal case against the auction house. Sotheby’s cites the records in asking the judge for a ruling on the case without the need for further discovery. The auction house says Easter claimed to have probable cause for seizure of the statue when in fact he was still scrambling to cobble together a legal theory to support Cambodia’s claim. The auction house also cites an expert on French law in arguing that the government’s legal theory — which relies in part on colonial-era decrees for Cambodia’s ownership claim — is bogus. Rather than take Levine at her word, Easter pursued the original documentation for the statue, which had been passed from the London auction house Spink and Sons to Christies. Remarkably, the Spink records indicate the statue was stolen from the Cambodian temple of Prasat Chen in 1972, according to the government letter. This is the first hint of documentary evidence to support the government’s claim of the statue’s theft. What else might be contained in the archives of Spink, which was dealer Douglas Latchford‘s primary pass through for allegedly looted Khmer antiquities? Could this archive also be the source of the “dispositive evidence” of looting cited by the Met in its recent return of two looted Khmer attendants to Cambodia? The next hearing in the case is scheduled for Oct 14th. UPDATE: The New York Times reported May 15 that Cambodia is also planning to ask for the return of a statue of Hanuman at the Cleveland Museum of Art. This is in addition to the Norton Simon Bhima and the Denver Rama we’ve written about previously, which Cambodian officials also want returned. All are said to have been taken from the same temple complex at Koh Ker. Neither Cleveland nor Denver would disclose the origins or collecting histories of the contested statues. The Metropolitan Museum of Art has agreed to return two ancient statues to Cambodia after receiving convincing evidence they had been looted and smuggled out of the country illegally. The 10th century Khmer statues, known as the Kneeling Attendants, have flanked the entrance to the Met’s South East Asian galleries for years and are among the museum’s most prized objects from the region. They were acquired in fragments between 1987 and 1992 as donations primarily from Douglas Latchford, a British collector based in Bangkok who is at the center of a federal investigation of antiquities looted from the ancient temple complex of Koh Ker. Cambodian officials announced last June that they would seek the return of the statues. At the time, Met officials said they had no information to indicate the statues were stolen. On Friday, the Met would not release details on what information led it to decide to return the statues, but noted recent press reports and information provided by UNESCO officials, who have been investigating looting in Cambodia. The returns suggest Cambodia has found substantial evidence to support its claim that several American museums possess looted antiquities that were illegally exported by Bangkok-based dealer Douglas Latchford. Latchford has denied the claim. We’ve previously identified several other museums that acquired Khmer antiquities from Latchford: The Norton Simon Museum, the Kimbell Museum, the Denver Art Museum and the Berlin Museums. The Met continues to possess several other antiquities tied to Latchford that will not be returned in the deal announced Friday. 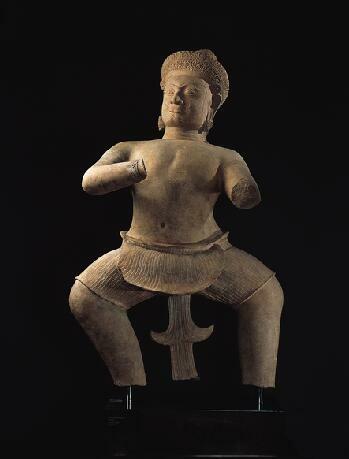 The Met’s returns will also have an impact on the on-going lawsuit in which the US government is seeking the return of a Khmer warrior statue at Sotheby’s. See here for our complete coverage of the case , including court documents that detail the government’s evidence. Recently, someone suggested we look into the ties between Douglas Latchford and the Berlin Asian Art Museum, where he is said to have enjoyed a “special arrangement” for several years. As you’ll recall, Latchford is the Bangkok-based British collector who was the source of the looted 10th Century Khmer statues now held by Sotheby’s and the Norton Simon museum. The Sotheby’s statue is the subject of a federal seizure lawsuit brought by the U.S. government on behalf of Cambodia, which claims the statue was illegally removed from the country in the 1970s. The government alleges that Latchford, identified in court records as “the Collector,” knew the statue had been looted from Koh Ker and conspired with Spink and Son auction house to fraudulently obtain export licenses for the statue in 1975. Latchford has denied the allegations. We’ve previously tracked Khmer art tied to Latchford to the Metropolitan Museum of Art, the Kimbell Art Museum, the Norton Simon Museum and the Denver Art Museum, where his partner Emmy Bunker is a research consultant. In March, a federal judge in New York found sufficient evidence for the US government to proceed with its forfeiture case against the Sotheby’s statue. One of those four objects was the sandstone Ganesh from Koh Ker. With regard to the examination of the objects’ provenance we must unfortunately assume that no other documents were obtained from Mr. Latchford than his personal confirmation and the information published in Bunker/Latchford: Adoration and Glory: The Golden Age of Khmer Art (2004). According to the UNESCO Convention of 1970 the Prussian Cultural Heritage Foundation does not acquire objects, the lawful provenance or importation of which is doubtful. For several years now the Prussian Cultural Heritage Foundation has been maintaining this attitude also towards items of loan. Unfortunately this standard was not yet maintained with the above mentioned objects lent to the museum by Mr. Latchford. We also note that the authors of the above-cited publication, “Magische Götterwelten,” were several Berlin Museum officials, including Marianne Yaldiz. Look for Wolfgang Luck’s 1 hour documentary on the case sometime next year on the German-French station ARTE. Some scholars had already pointed out the similarities with some suspicion. Betrand Porte suggested in an article in Arts Asiatiques (59, 2004) that the Berlin Ganesh may be the same one shown in the Parmentier photos, with a few details carefully altered to disguise its looted origins. Jean Baptiste and Thierry Zéphir suggested in the same publication that the question could be cleared up with a close scientific analysis. But when a museum consultant suggested testing the statue, the museum’s director Marianne Yaldiz reportedly grew upset. Latchford and Bunker provided a report of a visual examination conducted by Pieter Meyers — the same Los Angeles expert used when doubts arose in Sotheby’s investigation — that concluded the Berlin statue had not been altered. Soon after, the consultant left the museum. The consultant would not comment and Yaldiz, who retired in 2006, could not be reached. The scientific analysis was never conducted. 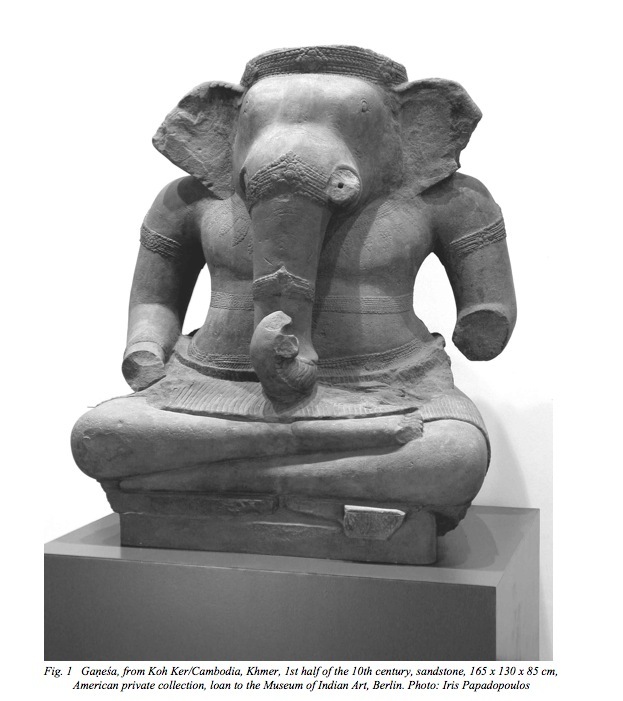 The Ganesh was removed from display in December 2006, and its whereabouts are currently not known. Given that commitment to UNESCO principals, we have asked the Berlin museum to provide details about its due diligence for the Latchford loans. What documented ownership history was provided with the loans? What assured the museum that the objects were not the product of modern looting? Where are they today? Why was the Ganesh described as coming from an American collection, when it fact it came from Latchford? And what purpose did the “special arrangement” with Latchford serve, aside from boosting the value of the objects for later sale? The museum has so far declined to answer those questions. We’ll post a response when we receive it. A New York judge has denied Sotheby’s motion to dismiss Cambodia’s claim — brought on its behalf by the US government — that a 10th century Khmer statue was looted and should be returned. The ruling, which dismissed several of Sotheby’s key arguments, is not a final ruling but allows the case to proceed. You can find our complete coverage of the case, including past legal filings, here. Museums and private collectors across the globe are buzzing with excitement over the March 22nd auction at Sotheby’s Paris of the Barbier-Mueller Collection of Pre-Columbian Art. But they should be concerned that almost half (119 out of 246) of the artifacts from present-day Latin America have no stated provenance before 1970. Peru has announced it is seeking the return of 67 objects in the collection that it claims were illegally exported from the country, which has required government permission for the export of archaeological material since 1822. Judging from our analysis of the collection, it is likely the first of several claims. UPDATE: The government of Guatemala has made a claim for 13 objects in the collection. “You cannot allow private collectors to unlawfully enrich themselves at the expense of the Americas’ pre-Hispanic cultural heritage,” the culture ministry said in a statement. UPDATE 3/21: Costa Rica has also claimed objects in the auction, the New York Times reports. UPDATE 3/22: Nord Wennerstrom calls the results of Day 1 sales “a train wreck” for Sotheby’s: 87 of the 172 lots failed to sell amid claims from Latin American countries and indications that several lots are modern fakes. Others suggest the asking prices were overly optimistic. Looking at some samples from the collection, one can see why. Of the 11 painted Maya vessels from Guatemala and Mexico, nine have no listed provenance before 1986. The market for Maya polychrome vessels developed around 1970 as looting of ancient Maya burial sites became more sophisticated and widespread. The growth of trafficking networks in Mexico and Central America prompted Guatemala’s 1966 Decree No. 425 – Law on the Protection and Conservation of Monuments and Mexico’s 1972 Federal Law on Archaeological, Artistic and Historic Monuments and Zones, which clarified claims of national ownership on all archeological material. Six of the Mayan vessels passed through Merrin Gallery between 1986 and 1990. The Merrin Gallery was also the source of a bronze statue of Zeus that was returned to Italy in 2010. The stated provenance claimed Edward H. Merrin had purchased it from a Swiss collection in the 1960s; in fact, it had been stolen from the Museo Nazionale Romano in 1980. The Merrin Gallery also appears frequently in the business records of Sicilian antiquities dealer Gianfranco Becchina, who has been charged with trafficking in looted Classical antiquities. In dealing with Pre-Colombian material, his first passion, Merrin “certainly handled masterpieces that should never have been removed from their original sites,” Ian Graham, a Mayan expert and director at the Harvard Peabody Museum, told the New York Times in 1989, the same year the Mayan vessels began passing through the gallery. Merrin’s response: ”Look, I have four children, I have a position in society, I am active in a number of charities – I’m simply not interested in anything illegal.” In 2005, Ed and Samuel Merrin were both charged with conducting a 10-year scheme to defraud their customers who collected Pre-Colombian art. Despite the 1997 Honduran Decree 220-97 that retroactively claimed “the state was the official owner of all cultural patrimony” (Luke and Henderson, 149) the market demand continues to fuel the destruction of a rich cultural site — and production of modern forgeries. Lot 34, with no listed provenance before 2004 and estimated to sell for between 40,000 and 50,000 Euros, may well be a contemporary example of how rising prices are promoting both the devastation and falsification of ancient Mayan cultural knowledge. Latin America has not been in the spotlight for cultural heritage claims to the same degree as Italy or Greece in recent years, but the illicit trade of pre-Columbian objects is a serious and continuing problem for countries such as Mexico, Costa Rica, Guatemala, Honduras, Brazil and Peru. Along with UNESCO’s international effort to increase protection of cultural heritage, Latin American countries passed a flurry of national legislation in the 1970s to establish legal ownership of cultural property. A glance though the Barbier-Mueller catalogue shows quite a bit of overlap with the Red Lists — from Nayarit and Olmec figures to Gran Nicoya stone grindstones, many of the categories of objects on sale in Paris on March 22nd are internationally recognized as the product of rampant looting. As with all ancient burial objects, the polychrome vessels and Ulúa marble vases are “essential to the understanding of the Maya belief system, mythology, and ideology.” (ICOM Red List: Latin America, p.8) Yet as these invaluable pieces are illegally looted they become untraceable to their original locations and all context is lost. Without context, our understanding of one of the most advanced cultures of ancient Mesoamerica is irreparably crippled. Frechette graduates in May and will soon be looking for gainful employment. Send any leads to us at ChasingAphrodite@gmail.com and we’ll pass them along. UPDATE: See Donna Yates’ excellent analysis of the Barbier-Mueller collection here and here.